Last weekend was one of the more wild World Cup weekends I have had. I have been racing on the World Cup tour full time for five years, and I have had a variety of disappointments, excitements, achievements and even heartbreaks. This last one came in a new form. Friday morning I woke up to an extremely rainy day in Lillehammer, Norway, where we generally find winter bliss in early November. But this year we found mild weather, green grass and a white ribbon of man-made snow spread across a 5-kilometer course through the hills. Having quite a bit of experience training in rain in Anchorage, I prepared myself for a day of cold, wet madness. Thankfully LL Bean provides us with a great rain suit, so we are ready to take on those miserable days. But there is more to it than that. On a sprint day, you are racing up to four times, with a lot of time in-between where the sole goal is to keep your muscles warm and your mind ready to sprint at max speed for three or four minutes. One cold muscle can make the difference between finding the speed you need to advance through the heats. I rolled up to the venue with just about my entire suitcase of spare clothes and layered up the nano-puff under my rain suit to the point that I looked like a fluorescent, wet snowman. What felt silly performed wonders. I had my best skate sprint ever, advancing all the way to the finals and crossing the line in third place for my first-ever skate sprint podium. Skate sprinting was the only discipline I hadn’t reached the podium in, and it was one of my main goals for the season. Tears welled in my eyes as I walked to the podium, remembering that you can never take success for granted. I headed back to the hotel on a high, so excited to share the news with my friends and family back home who would be waking up soon. A group text chain with all my new and old teammates filled with congratulations. Not long after, Kikkan Randall and Holly Brooks told us about a massive earthquake back home in Anchorage. Expecting it to be like our average quake, my roommate Rosie Brennan and I laughed it off. And then the pictures started coming in. Seeing people’s stuff thrown everywhere made me hope that a random object didn’t crush my housesitter. After texting with her, I learned she had already left my house and had gone airborne in her car when the quake went off as she was commuting to work. But she was OK. The excitement of my race was gone. I started reading stories online about the damage. Images showed roads, bridges and houses collapsed. As I passed all my World Cup companions in the dining hall, they congratulated me on my day, but I struggled to hear them. My mind was focused on something completely out of my control back home. I had heard my neighbors on our security system say, “there is water spraying everywhere,” and I was in panic mode. I was thousands of miles away from home and felt like I couldn’t do anything. Broken belongings aren’t a big deal, but I wanted to make sure there wasn’t a gas or water leak destroying the place. As I was getting ready for bed, I called Holly and asked her to check on my home. By this time it was 10 p.m. in Lillehammer, and I needed to focus on two more days of racing. Energy is hard to come by, and I knew I was bleeding it with worry. But I had to know everything was OK before I was going to sleep. Thankfully, I sent the right friend over. Holly crawled under the house, shut off the main water and called my fiance Jo, who was out of town. “There is a small leak, but it is OK,” she told me. I laid awake all night ensuring myself that Holly had things under control and nobody had died — all wonderful things. Still, I couldn’t take my mind off it. As I lined up for Saturday morning’s race, my mind was in Anchorage. The crazy images were stuck in my brain. I was about to start a 30-minute race and I needed to be in the moment, ready for the pain cave, not back home in Anchorage. After 2.5 kilometers, I headed up the massive climb on the course and felt my brain click. I was back in place, ready to fight. I skied the final 7.5 kilometers as hard as possible and crossed the line happy to have put together a race I was proud of. By Saturday evening, Jo had flown home. He walked me through the house and showed me all the damage. It had been much worse in my mind, and thankfully he is going to be able to make everything OK. We managed to water the streets of the entire neighborhood, test the limits of our sump pump and give our basement and garage a good washing, but my little house on the hill will survive! In Sunday’s final race in the Lillehammer mini-tour, I celebrated making it through the race series as well as Anchorage making it through the earthquake. I am so happy and thankful to know there were no casualties in the 7.0 shaking of the city. I feel for those who face a lot of cleanup. And more than anything I am darn thankful for the people in my life: the ones who celebrate the highs with me, but are there for me in the shaking chaos too. One of my friends told me that Anchorage had jumped up and down so hard celebrating my podium finish that they had shaken the ground a little too hard. If that is the case, I have a lot of friends and fans back home, so thanks for the cheers. But next time, let’s bring it back down to a level 1 celebration! 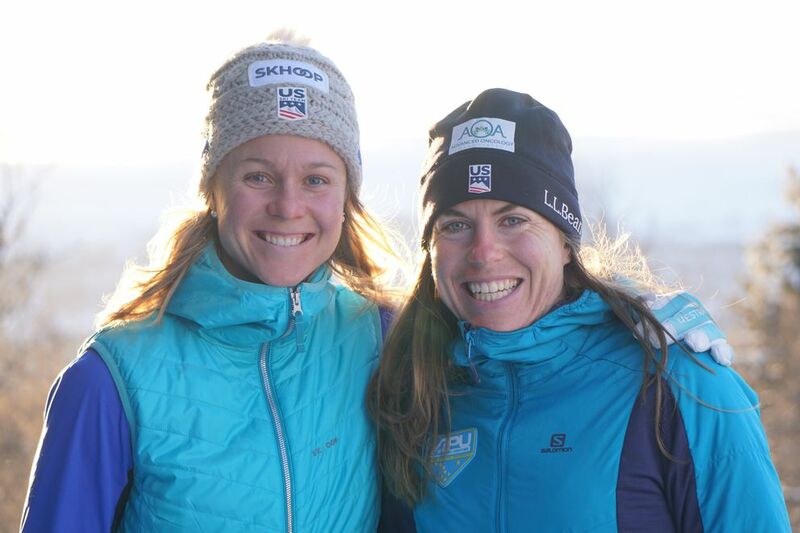 Sadie Bjornsen is a two-time Olympic skier who lives and trains in Anchorage. Her third-place finish in Friday’s World Cup freestyle sprint race marked the 10th podium finish of her career.